We had a fantastic time, celebrating the end of Year 6 at our annual Leaver's Prom. It was a chance for everyone to get dressed up and enjoy themselves. Hope everyone had a fantastic Easter break! In our final term as Year 6 we shall be exploring our Earth learning about extreme climates, weather phenomena and how volcanoes, earthquakes and tsunamis are formed. We are going to find out about the location and countries of South America, investigate the human and physical geography as well as carry out an in-depth study of Brazil. In Science we shall be learning about evolution and inheritance in addition to independence and adaptation. In DT we shall be designing and making shelters and in Art investigating the work of the Japanese artist Hokusai. Year 6 took part in a Science Skills morning hosted by teachers from Framwellgate School. They learned about the three states of matter: solids, liquids and gases and had the opportunity to collect and test a wide range of gases. A big thank you to all the staff who made this morning possible and for allowing to have so much fun whilst still learning! We had the opprotunity to invite Rosina from Action Aid back to Finchale only this time she came to do a workshop on Brazil. We learned about the Gomez family who lived in a remote area of the Amazon rainforest comparing their homes and lives with ours. There was a chance to find out about the different types of animals that live in the rainforest and we even got to hear the sounds and calls that they make. However the best part of the workshop was getting to try the different types of chocolate! As part of our topic work we have looking at the Japanese artist 'Hokusai' who used wooden block printing to create his masterpieces. We were inspired by looking at his picture of 'The Great Wave' to re-create our own versions using acrylics. I'm sure you'll agree they look fantastic! Finchale took part in an athletics competition at Maiden Castle and were very successful. We had four children make it through to the County Championships they were: Harry (triple jump & relay), Zeyna (60m & relay), Rachel (80m & relay) and Owen (800m). Year 6 have had an action-packed week after SATs and were very lucky to have Mr Bell (a former governor) come in to turn them into budding entrepreneurs! At the start of the week they set up their own business, carried out market research and made two different ice-creams. Following this, they narrowed down the ice-cream to the one that they would serve to the 'dragons' on the final day of the week when they presented their business plan and asked for investment in their company. What a brilliant week, the groups all worked incredibly hard at pitching their ideas and despite it being very close there was one winner...Trrific Treats! We must say a HUGE thank you to Mr Bell for working with us all week, to the Dragons for giving up their time to watch our presentations and to Sainsburys for providing us with all the ingredients needed to make our ice-creams! Well done to everyone who took part in the Fun Run and raised money for the Nepal Earthquake Appeal. On Friday 24th April we held our very first Celebration of Reading day at Finchale and it was an unqualified success, thoroughly enjoyed by pupils, staff and governors alike. Each class decorated their door based on a story, pupils and staff dressed up as a book character and story-telling sessions were held throughout the school with children choosing which book they wanted to hear. 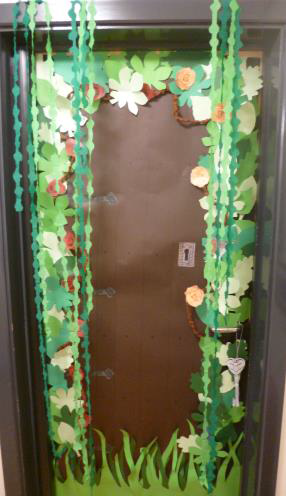 Can you guess the book from our door? 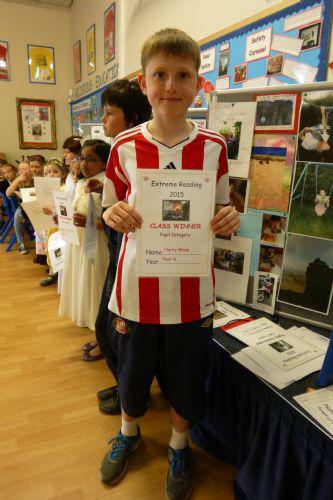 Well done to everyone who came dressed as a book character and took part in the 'Extreme' reading challenge! 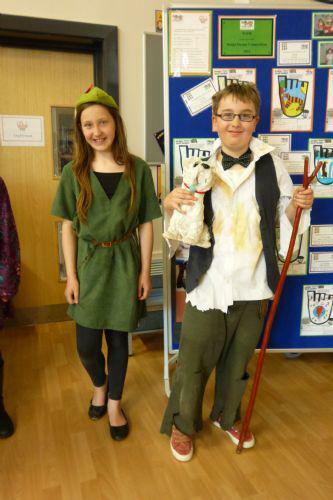 Mia as Peter Pan and Ben as Mr Stink! Happy New Year! Welcome back everyone. This term we are going to be learning about 'Britain since the 1930s' and looking at 'Crime and punishment from the Romans to the present day'. In English we shall be reading the novel 'Frozen in Time' by Ali Sparkes and link that to our Science work of 'Living things and their habitats' and 'Electricity'. We shall be studying the work of the artists Clarice Cliff and Andy Warhol and in computing designing a racing game using Kodu. John Roxborough came in from Durham University to work with Year 6 as part of our topic work based around 'Crime and punishment - Romans to the present day'. We learned all about the slave trade, why it continued for 300 years, what life was like for a slave and some of the punishments that were used. We also learned about local crimes that occurred in Durham such as that of Mary Ann Cotton the infamous poisoner and about some of the punishments that were used throughout the ages in history. Experiencing what life was like on a slave ship. Finding out what the artefacts were used for. We celebrated Red Nose Day by donating £1 to come into school wearing non-uniform and in family groups we decorated glasses, moustaches, beards, hats and ears to make our faces look 'funny for money'! At the end of the day, S.W.A.G. led the assembly and each class sang a song to celebrate. As part of our Science this term we are investigating electrical circuits. This week we have been working with our science partners learning about parallel and series circuits. This half term, Year 6 are receiving cricket coaching from Chris. Well done to the SWAG team for presenting an excellent assembly for the whole school telling them all about UNICEF Day for Change and where the money that the school donated will be going. Also for organising a brilliant talent show that everyone enjoyed! Well done to Toni, Charlie and Sophie for winning the class act with their dance routine! Glynn came in to work with KS2 and to show them just how good Judo can be. They learned about different holds and rolls and how to pin down an opponent. As a final part of the Junior Neighbourhood Watch programme that Year 6 have been involved in, they got a chance to visit the Police Dog Support Unit to experience a day in the life of a working police dog. We learned about the different types of breeds and jobs that police dogs do, watched police dogs in action and got a chance to sit in the police van and put on the sirens and blue lights! We would like to say a big thank you to everyone there for making it a very enjoyable and educational day! Well done to Lydia, Mia, Maddie and Drew for winning the quiz! We have been looking at the artists of the 1960s: Roy Lichtenstein and Andy Warhol and learned about style of art known as 'Pop Art'. We have re-created our own work in this style. Debbie has been working with the Year 6 as part of the Junior Neighbourhood Watch program. She came into school to present the class with some gifts, in assembly , for completing the program. This half term Year 6 are been coached by Sarah, a gymnastics coach. Each week they have been focusing on a different aspect such as: balances, rolls, handstands and lifts. As part of our topic work we have been learning about the artist Clarice Cliff and looking at her work. She was an English ceramic artist active from 1922 to 1963. She began as an apprentice potter. By reason of her talent and ability, she became a ceramic artist, becoming the head of the factory artistic department. Clarice is well known for her use of bold colours and geometric designs. From studying her work we created our own plate designs. This term we are going to be learning all about World War II. We shall begin with looking at the cause of WWII, leaders and key events. Then focus on the impact war had on children through the Blitz, evacuation and rationing. Next we will learn about the effects war had on everyday life and discuss the importance of morale during the war. We shall visit the Durham Light Infantry (D.L.I.) Museum for a 'hands on' WWII workshop where we will get the chance to handle artefacts and find out about how our area was involved in WWII. KS2 were outstanding in their performance of 'Aladdin Trouble' I am so proud of everyone you were amazing! We are such a lucky school to have so many talented children! This week Anne came in to talk to Year 6 about the R.N.L.I and the job it does. We learned about the different types of rescue boats and how long the R.N.L.I. have been in operation. Anne brought in some uniforms to try on and we learned about the different coloured flags that are used at the beach. As a class we looked at pictures of the beach and river and spotted potential dangers that were present. Year 6 have been learning all about rationing and decided to follow an authentic war time recipe - Carrot biscuits. We used ingredients that were rationed to make the biscuits and learned how many root vegetables like potatoes, carrots, parsnips and beetroot were used to replace flour and sugar in many recipes. The verdict was... they tasted great! This week Alison came in from the Dogs Trust and brought in her own rescue dog Mollie. We learned about what the Dogs Trust do, how to look after a dog responsibly and how to stay safe around dogs when out and about. This week Judith and Linda came in to talk to Year 6 about seat belt safety. We learned that by law, you must wear a seat belt in cars and good vehicles where one is fitted. Children must use a child seat or booster. A driver can be fined if a child under 14 years does not wear a seat belt or child restraint as required. Anyone 14 and over not wearing a seat belt must pay the fine themselves. Furthermore a child can use an adult belt and no booster seat when they reach 135cm in height or their 12th birthday, whichever comes first. We learned that a car travelling at 30 m.p.h. takes on average 23 metres before it comes to a complete stop. This week Dean came in from Durham Council to talk to Year 6 about 'Environmental Crime' which can be: litter, dog fouling, fly tipping and graffiti. We learned that if people commit environmental crime they could be served a FPN (Fixed Penalty Notice), given a fine or even sent to prison. We learned that the total cost of keeping County Durham clean every year costs £6.5 million! In Science this week we had a really special visitor - Mrs Joyce our Science Governor, came into Year 6 to lend a hand and find out what we were getting up to. First of all Year 6 were given a range of materials to test to see if they were soluble in water. They looked carefully to see if any of the following occurred: colour changes, if a gas was given off and if the material dissolved. Following on from this they then looked at ways of separating materials from their mixtures. They used filter paper to separate sand from water and a tea-light burner to evaporate water from a salt solution, leaving solid salt behind. They had a great time learning as well as wearing the safety glasses too! A big thank you to Mrs Joyce for all her help! This week Graham came in to talk to the class about wildlife crime; how to spot it and how to report it. We learned all about badgers and that their underground home is called a sett. Graham told us what we should do if we came across a sett, that badgers receive legal protection and that it is a crime to disturb its home or catch badgers. We learned how badgers and other wildlife are persecuted by criminals and that if we suspect suspicious activity to report it straight to the police. In Science we have been learning how levers and pulleys allow a smaller force to have a greater effect. We made and tested the following pulleys: Gun tackle, Luff or Watch tackle, Double tackle, Gyn tackle and a Three Fold Purchase and used them to lift a 1kg weight. We recorded how many pulls were needed to lift up the weight. We learned that by having more loops of string in a pulley we lifted less weight over a larger distance. This is because the weight is spread over each loop of string. We have been raising lots of money for Children in Need by having a non-uniform day. Everyone was asked to donate £1 to either come dressed as a superhero or in something spotty. The Year 6 girls that are in S.W.A.G. (School Worldwide Awareness Group) led an assembly and then provided resources and activities for everyone to do in their family groups. This week Joanne came in to talk to us about alcohol and energy drinks. We learned that one high energy drink contains the equivalent caffeine of four cups of tea and an unbelievable fourteen teaspoons of sugar! We carried out a questionnaire relating to alcohol and even got the chance to try on some 'beer goggles' to give us an idea of how your senses and mind are impaired when you have been drinking a lot of alcohol. Well done to Caitlin for creating the winning design for Roberta Blackman-Woods MP's official Christmas card. This week in Science we investigated how the shape of an object effects how quickly it travels through water. We used playdoh to test five different shapes and timed how long it took them to travel down a measuring cylinder full of water. We learned that the smoother and more streamlined an object is the quicker it will travel through water and the less water resistance it will have acting against it. Today Year 6 attended the annual Safety Carousel which included workshops on: Fire, Gas, Electricity, Internet, Water and Road Safety. We learned that cyberbullying is bullying that takes place via technology. Whether on gaming sites, through a mobile device or via a social networking site and how the e?ects can be devastating for the young people involved. In this session we learned how to stay safe when near water. We found out that it only takes a small amount of water to drown in. We played an interactive game in this workshop learning about how fires are caused in the home, how to prevent them and what to do in an emergency. Well done to Adam who demonstrated how to do the: Stop, Drop and Roll! Bob talked to us about electrical safety. We learned how many volts overhead cables can carry and how electricity at high voltage can jump, making it incredibly dangerous. In our final session we had to investigate a road scene and work out from the clues given what had actually happened to cause the accident. Through this we learned how important it is to be aware of our surroundings when crossing roads, how to cross the road safely and the impact accidents can have on the whole community. We had a great day and learned lots of important safety advice. This week we have been learning about the role of the police and the different types of jobs that they have. We watched a video showing exactly what happens when a 999 call is made, the different people that are involved in assisting the person that made the call from the dispatcher to the dog unit, beat officers to Crime Scenes Investigators (CSI). We also learned about the different types of uniforms officers wear and had our finger prints taken! This week we had PCSO Debbie Saddler-Watson and PCSO Sharon Bowman in to talk to us about Bullying and Hate Crime. We learned that Hate bullying is a special name given to crimes against certain types of people because of differences they may have such as: Race, Disability, Religion or Gender. We discussed why people bully others, what it must feel like to be a victim of hate crime and what the consequences are if you bully or commit a hate crime against someone. Furthermore we learned that the age of criminal responsibility in England and Wales is 10 years old and that children between 10 and 17 can be arrested and taken to court if they commit a crime. 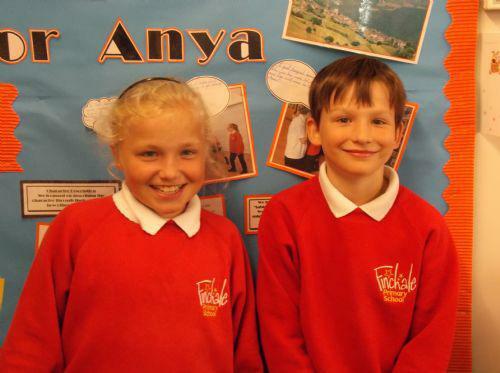 Drew and Bailey were democratically elected by Year 6 to be our School Councillors. 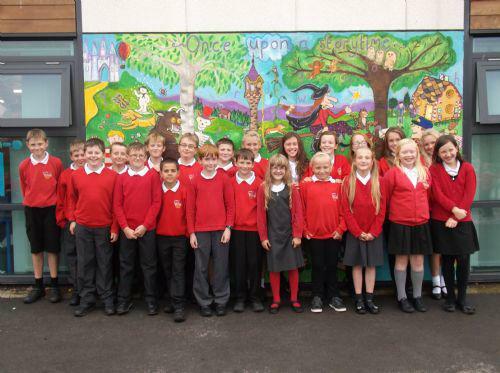 They form part of a representative group of pupils elected by their peers to represent their views and raise issues with the Head Teacher and governors of their school. How lucky were we with the weather? What a great day we had at the DLI Museum learning out all about different aspects of WWII, getting to try on outfits and handling original artefacts. One arriving at the DLI we were taken around the WWI zone and looked closely at the uniforms and weapons of soldiers who fought in that battle. Then we focussed on WWII soldiers, learning about DLI men who had won the Victory medal and about different campaigns. After that everyone got a chance to handle real-life artefacts and uniforms and we learned about the different types of jobs that people to support the war effort. Thank you to Joseph, Maddie, Harry and Kieran for bringing in and sharing some WWII artefacts with us. Year 5 are taking part in a project in conjunction with Durham Constabulary all about looking after the community and how to keep safe. This first week we met Debbie and Catherine who are PSCO's they came in to talk about 'Anti-social behaviour'. We learned what to look for and how to report it. Each week we will be looking at a different theme. As part of European Day of Languages Year 6 were very fortunate to have Mrs Hammill, one of our school governors,come in and teach us some French words, phrases and a song all to do with out topic on food. We learned how to order a drink in a cafe and sang a song about cauliflowers! Friends of Finchale PTA and Finchale Primary held a coffee and cake afternoon in school to raise money for Macmillan Cancer. Thank you to everyone who baked cakes to sell , for all those who came and supported the event and to the Year 6's who manned the stalls! Does the size of a parachute affect the speed at which it falls? In Science we have been investigating air resistance. We made three parachutes with different sized canopies, dropped them from a given height and timed how long it took for each to reach the ground. We learned that the size of the canopy does affect the speed the parachute falls and that the bigger the parachute the slower it falls. In our English lessons we have been reading the novel 'Waiting for Anya' a story based in occupied France during WWII an set on the French and Spanish border. Each group were given a scene to re-enact and on the command of 'freeze' hold that scene to create a tableau. We then considered the thoughts and feelings of the characters in that particular freeze-frame. We have been investigating the effect different surfaces have on a weighted object. We took a weighted container and measured the amount of force needed to pull it over a variety of different surfaces. We learned that rougher surfaces like grass and tarmac needed much more force to pull the container compared to that of smoother surfaces like laminate and plastic, therefore rougher surfaces create more friction than smoother ones. We have been learning about the 'Blitz' and why cities were chosen as the target for air raids. Through this we created our own Blitz art using soft pastels and black paper. This term in PE Year 6 are being coached in tennis by Sam. Each week they have been learning new skills and techniques to enable them to improve and further enjoy tennis. In Science we have been investigating the connection between gravity and weight. We weighed a number of different objects in the classroom using forcemeters and then calculated what their weight would be on the Moon. We learned that gravity causes objects to have weight and that the gravitational force on the moon is different to that on Earth. KS1 and KS2 took part in the annual Mini Olympics held at Maiden Castle and for once the weather was on our side! We took part in a variety of different activities including Judo, Volleyball, Tennis, Football and Cricket, learning new skills and had a thoroughly enjoyable day.